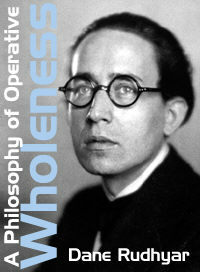 Part Six of the series A Philosophy of Operative Wholeness features early treatments of several concepts and symbols which will become key features of Rudhyar's later work. This installment develops, more so than the previous intallments, the concept and symbolism of the Cycle and the Seed. It is noteworthy that in the second paragraph Rudhyar uses the word Pleroma for the spiritual seed harvest of a cycle of cosmic evolution, a terms and concept which plays a paramount role in Rudhyar's philosophical and metaphysical magnum opus, Rhythm of Wholeness. The Law of the Cycle is one and eternal. It applies to all cycles, and cycles are the very substance of Time. Krishna states this law in the Bhagavat Gita when he says, somewhat cryptically: "I am the beginning, the middle and the end of all that is evolved," and also "I am the seed of all existing things." The seed, in every species, is the condition nearest to that of a sphere which the life forces manifesting through that species may ever reach. As the sphere is the perfect cosmic form toward which all particular life-forms are evolving, one may infer that the seed is the point of perfection of all life. But this seed-perfection is not only physiological. The physical seed is also the symbols of the positive and spiritual perfection of beings who have reached the condition of cosmic integration and who can be called Aeons and Pleromas – that is, Wholeness of time and space. There are three essential moments in any complete cycle and these are seed-points. First, the vernal point of germination when the first root breaks forth through the "circle of wholeness" and begins the phase of manifested growth; then, the summer point of fecundation, when the seed reappears potentially at the heart of the flower; lastly, the autumnal point of sowing, when the seed falls into the soil or is absorbed as food by animal life. There is a fourth point, at Christmas; but it is not situated in the world of evolving forms or time, as it is the birth of time itself in the realm of permanent wholeness. These three seed-points are the beginning, the middle and the end of all that evolves – that is, of all forms that are subjected to the law of change. They correspond in man to the moment before birth, the thirty-fifth birthday, and the moment of death. These are the moments when essentially Krishna operates in man. But Krishna is not the ordinary consciousness of the ever-changing personal man or woman; no more than the seed is leaf or stem. Krishna is "the Ego" which is seated in the hearts of all things. He is the Center, drawing all eccentrical life-forms to the condition of the sphere. He is Time, the mysterious executive of the Law of Wholeness; that which forces the ray out of the center, the root out of the seed, and the Ego out of the dream-state of pure subjectivity; that also which polarizes the within and the without, the Woman and the Man, toward the re-constitution of wholeness (the sphere-soul); that, at last, which gathers the many dual expressions of life-in-form into the crystal-globe of the seed-center above, where the Ego will see the records of the past transmuted nto the substance of eternity. The moment before birth shows to the earth-bound Ego the need for embodiment, how that which had been left not-whole can be made whole by a series of form-experiences. The moment after death reveals to the Eternal Watcher in the heart the balance-sheet of the life; after which he re-enters the state of relative wholeness, as a sleeper disturbed by some noisy intrusion falls back to his sleep. At the point of mid-life the conscious elf of man, like Dante, explores his depths and his heights and joins the other self that pours down form the heart of Light. They at-one within the form; essentially the inner or causal form (the holy place of the Seed) but at times also the outer or bodily form (the place of darkness and redemption). During the first moment the forces of destiny are knotted into the form ready to breathe the air of the earth. Time stamps its seal upon the Ego: the astrological chart of nativity. The cycles begin to operate. Before birth Time locks itself up into a seed-moment, which thereafter unwinds itself. Time then is the Past – that is to say, during the first half of the life, generally speaking, the past locked up in the first seed-moment works itself out into objectivity. At 35 man is the synthesis of his Past. More than that, he is also the Presence within which an organic form, as fully developed as it can normally be; just as the plant has reached its apex of development when flowering takes place. At 35 (though this many not come to each life at the exact point of years(1) man is the flower. Within that flower the future takes birth to regenerate the past. This future is the child of eternity. For eternity is wholeness of time; and the future is the sacrificial incarnation of Wholeness into particular form, for the purpose of neutralizing and redeeming, in and through that particular form, the past (that is, the not-whole). Thus, at the mid-life point, eternity or Wholeness descends into the form – that is, whatever of Wholeness can be taken in, as it were, by that form, fecundates it. The planet absorbs through the flower the hidden sun. Heaven meets earth in the glowing tabernacle; or, to put it in another way, the two polarities of life being brought into conjunction within the flower, wholeness, finds itself reconstituted. This is the ‘eternal’ moment, birth being the ‘original’ and death the ‘summational’ moments. It is in this eternal moment that freedom resides; for freedom exists only where time is neutralized. There is no freedom in birth; no freedom in death. But there is a certain amount of freedom in mid-life. Then wholeness manifests and brings with itself as much freedom as the form can perceive and remember. What the form then perceives and remembers, what it has been able to absorb of eternity – that determines the summational moment of birth yet to come. Birth opens the door, death closes it. What actually happens within the sanctuary is concentrated spiritually at the mid-life point, in the one eternal moment. This moment is the Spirit-in-the-Body, Mahaeshwara, the great god, the god that is operative wholeness, and not only static wholeness. It is Christos, that eternal moment which is Eternity (the Christos) crucified in form and thereby made operative, made a Bridge over the keystone of which Spirit and Matter commune. Mid-life, being the one eternal moment, does not need to be lost again in the consciousness of time. At mid-life Buddha attained Nirvana, which is precisely the eternal moment. But Buddha did not forget Nirvana. He carried Nirvana into his every deed. Thus every moment thereafter became a mid-life point; a ceaseless consummation, a perpetual birth of futurity without any residuum to be burned up by the fatality of some past-to-come. Every act of the ordinary man generates that residuum which later on will become a past to be redeemed by a new incarnation. It produces refuse. But the deeds of a buddha and of any buddha-like adept are refuse-less. They are crystal spheres in which eternity is focalized as a power of integration. The power of integration is that which makes the not-whole whole. It is the true healing power, the radiance of the Christ. "I am the beginning, the middle and the end," said Krishna, "I am the alpha and the omega," said Jesus. A is the beginning. O (or OU) is the end. M is the mid-point. This gives us the word AMO – I love. The latin world describes the constant progress of the cycle; beginning, middle and end. Eery day and every minute are cycles. The wheel goes on, everlastingly. AMO, AMO, AMO . . . much love, much motion; yet no peace. The Aryan(2) sage had seen deeper. He realized that beginning and end are illusions that can be dispelled; that time can be overcome. By an intense effort of integrating will, he joined the beginning and end, negated both by sounding the closed tone of eternality; the closed lips’ hum, which is the undertone of Silence, the murmur of eternity; the sacred letter M; the great Mother that is wholeness in operation, the Sea in birthing of living forms consecrated to the eternal alchemy of past into eternity.